Response: In humans, an excessive intake of sugars has been linked to the development of metabolic disturbances, and therefore to an increase in the risk for cardiovascular diseases. Specifically, increased consumption of simple sugars in liquid form, as beverages sweetened with high fructose corn syrup or sucrose, has been linked to obesity, insulin resistance and type 2 diabetes. However, two questions remain unresolved: what is/are the underlying molecular mechanism(s) linking these metabolic alterations to cardiovascular diseases? Are the adverse cardiovascular and metabolic effects of sugar-sweetened beverages merely the consequence of the increase in caloric intake caused by their consumption? To answer to these questions, we performed a study in female rats, which were randomly assigned to three groups: a control group, without any supplementary sugar; a fructose-supplemented group, which received a supplement of 20% weight/volume fructose in drinking water; and a glucose-supplemented group, supplemented with 20% weight/volume glucose in drinking water. Response: Many neurological diseases result in declines in mitochondrial content and function in the brain. 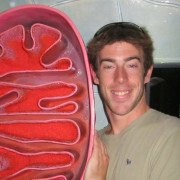 Therefore, the purpose for this study was to determine if mitochondrial content could be enhanced in the brain through exercise, as previously demonstrated in skeletal muscle, and also to determine if similar exercise-signaling pathways are activated between the two tissues in the process. This study found that despite reproducing similar findings in skeletal muscle, acute and chronic exercise did not activate traditional signaling mechanisms (AMPK, ERK1/2, CAMKII, P38) in either the cortex or striatum of the brain, nor did it result in sustained increases in mitochondrial respiration, DNA copy number, or protein content. Dr. Reinhardt: It can be very difficult for some people with obesity to lose weight despite great efforts. There is an immense deal of individual variability in weight loss success. Beyond differences in diet adherence, it is not clear what causes this variability in weight loss. Through a study conducted at our facilities at the National Institutes of Health in Phoenix, Arizona, we have now shown that individual differences in biology – more precisely, differences in the amount of energy bodies use during fasting – make it difficult for certain obese people to lose weight. Professor Schultes: Sleep loss promotes the development of obesity and diabetes by metabolic and behavioral mechanism. Professor Schultes: The strength of the influence of sleep loss on metabolism is quite surprising and unexpected. Professor Schultes: Sleep is important for metabolic health. Thus, clinicians should ask their patients about their sleep and patients should be aware that sleep is important for their health. Professor Schultes: Interventional studies improving sleep are clearly needed to see in how much improved sleep can improve metabolic health, e.g. weight loss in obese, better glycemic control in diabetics.